Strangely, the name of Moses does not figure in this sidra. No “The Lord spoke to Moses”. No “And Moses went, stood, said, made, did”. As the Ba’al HaTurim points out, it’s the only section of the Torah after his birth that does not mention Moses by name, though there is a hint of his existence and task in the opening word, v’attah – “and you” (Ex. 27:20). As we move into Chapter 28 there are more instances of the same phenomenon. Explanations include the co-incidence that this week happens to be Moses’s Yahrzeit, 7 Adar. The Ba’al HaTurim links the omission with Moses’s call to God, “If You won’t forgive the people’s sin, erase my name from Your Book” (Ex. 32:32). Another place where we would expect Moses’s name but don’t get it is the Haggadah of Pesach. There must be a deliberate policy behind these omissions. Possibly it is to prevent the rise of a Moses-cult. 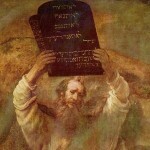 Even so – as with the beginning of B’reshit when the Torah says “The spirit of God hovered over the waters” (Gen. 1:2) – the spirit of Moses hovers all over the Torah. One can’t understand or appreciate the Torah without the (sometimes unspelled-out) thought of the great leader. Similarly, all of us lesser individuals know that who we are and what makes us can’t be understood or appreciated without our background and personal history. Even if it isn’t spelled out, its influence hovers over our deeds.